It sure has been a busy time of late BUT last night I had the bestest time@ Scrapsidaisy ! We held a fundraiser for Uniting Care & held a Pancake night! YUMMO! It was so much fun! The girls were all scrapping up a storm & munching down delicious pancakes cooked by the lovely Leisa. Leisa happened to be celebrating her birthday & shared her precious time with us. I hope your day was a special one Leisa - you sure do deserve it. Myself & Leisa donning the Pancake apron......lol...cute hey! HAPPY BIRTHDAY LEISA! A page I created for the Scrapsidaisy Forum - The challenge was to use your journalling as the title & this was my take. 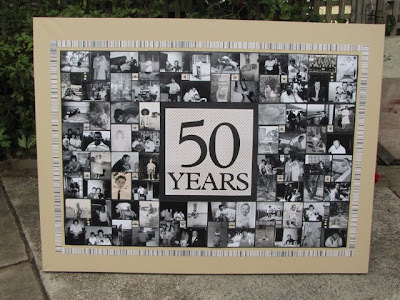 This is a Huuuge canvas that I created for my beloved brother for his 50th earlier in the month. He just loved it & thanked me so many times it was fabulous! I have spent another evening loving the Love Letters - Little Yellow Bicycle collection. These first 3 pages just about used up every scrap of paper I had left from the whole range.I plan to use the scraps that are left to make the D.Hubby a Valentines card. I hope that whatever you are doing this (HOT, HOT, HOT) wewekend you are doing safely & with those you love. A couple of new pages that I created for the SCRAPSIDAISY February Challenge. I am really loving the NEW Little Yellow Bicycle - Love Letters range of papers & embellishments........YUMMO!